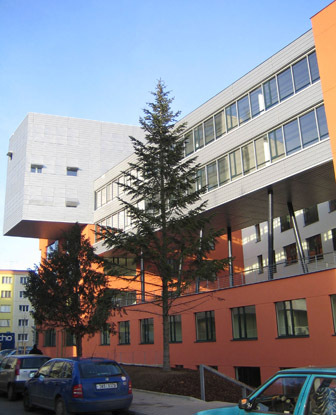 A new, high-tech occupant - and an innovative ventilated facade system - have reenergized an old industrial complex in the Prague 4 district of the Czech Republic. Renamed and reopened as the Czech Savings Bank's IT building at a cost of about $48.5 million, the highly contemporary building features several upper stories bearing a facade system that is the first of its type in Central Europe. 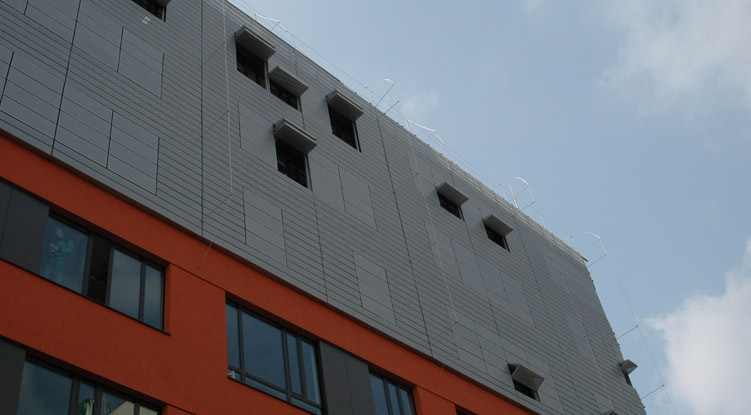 Engineered and supplied by Hunter Douglas Contract, the ventilated facade with integrated solar-control system presents both a state-of-the-art aesthetic and a highly sustainable solution. 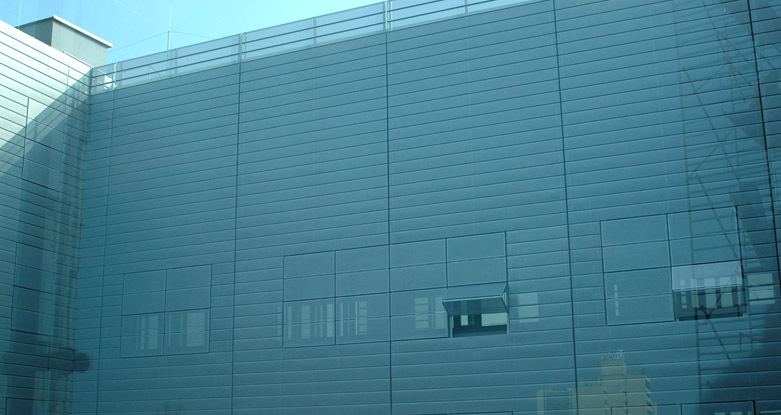 The multiple-panel metal rainscreen, a QuadroClad system called Perforated MPF, was incorporated on the outside of a glass curtain wall. This solar screen reduces thermal loading while admitting a diffuse, pleasant light. 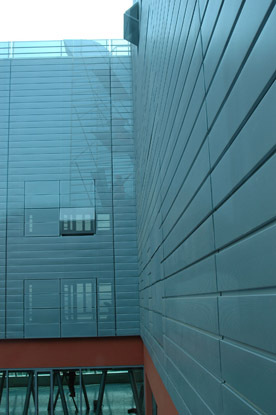 In terms of aesthetics, reflections and light from the curtain wall are visible through the metal scrim, adding depth and visual interest to the composition. Most remarkable, the design architect Martin Kotik of the Prague-based firm, Omicron-K, detailed the facade with an integrated "active" solar-control feature. Dozens of collapsible vertical shutters, spaced seemingly randomly around the facade, open and close as the building's occupants see fit. Occurring singly, in pairs, or groups of four, the accordion shutters glide silently into position, animating the penthouse structures otherwise minimal visage. Thanks to the architect's work, and the unique facade system, the Czech Savings Bank's leaders find their building both unique and effective. "The new, modern buildings will on the one hand, enhance the physical security of our IT systems; on the other hand, will mean significantly improved working conditions for about 1,100 employees," said Jack Stack, Chairman of the bank. Though its penthouse floors are a stark gray, the building's lower floors incorporate a brick-red cladding and a mix of materials that reflect the surrounding urban context. 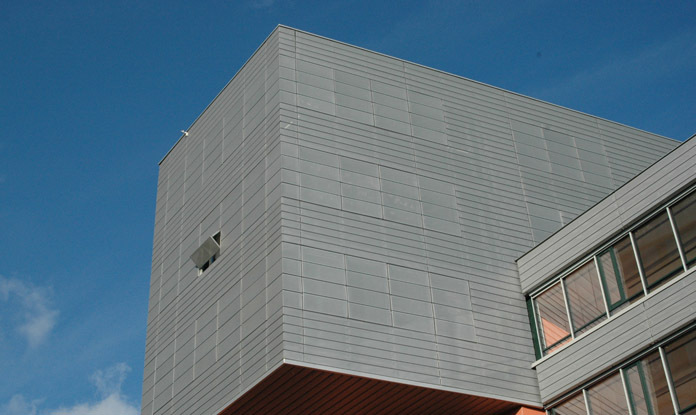 Overall, however, the image of the building was designed to "to resemble a large computer chip," says Kotik. The slate-colored Hunter Douglas panels have an overall uniform appearance, but slight variations form subtle patterns, with additional interest provided by grouping window openings with operable shutters. 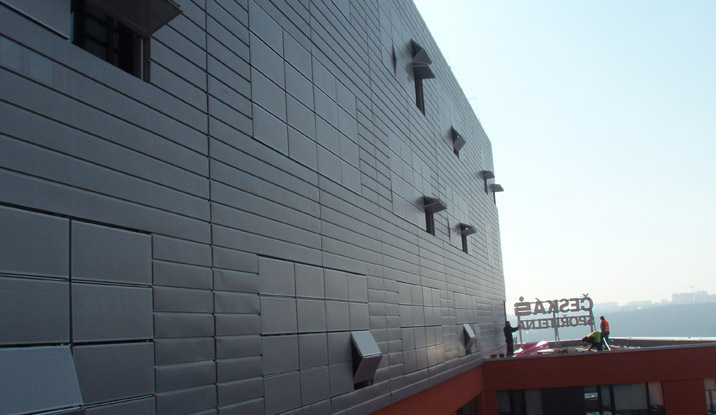 Kotik used multiple types of exterior wall systems: The QuadroClad aluminum facade panels were specified to serve as an integrated solution of panels and back-up system. The lightweight skins are fused to an expanded honeycomb core, also of aluminum, helping them retain flatness and adding strength. 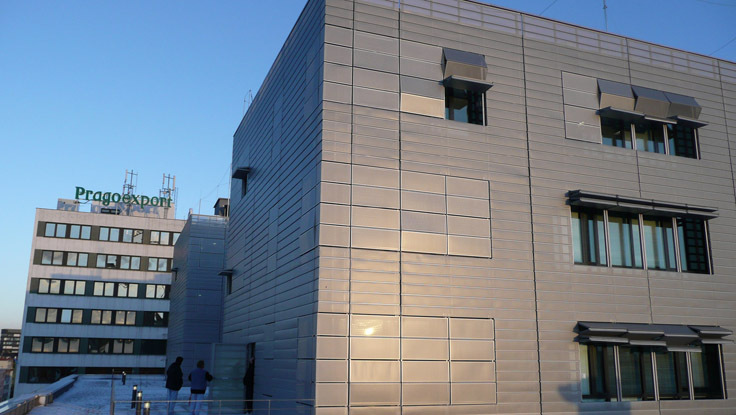 The architect says the system was highly effective as a facade retrofit, allowing over-cladding this former industrial building. Inside the IT building, a spacious, daylight-filled atrium greets bank visitors and employees. For the staff's convenience, technical centers organized throughout the floors have social facilities including tea kitchens, a cafeteria, and meeting rooms. Two other buildings in the same former industrial complex have also been adapted, adding more offices, a 20-story apartment building with 114 apartments, and a shopping area. 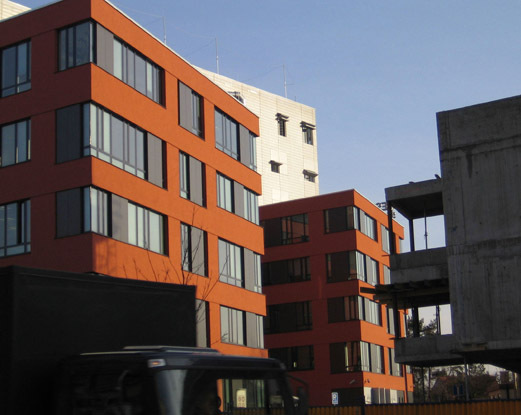 The result is a modern, vibrant location in one of Prague's up-and-coming neighborhoods.